This page is about buying a camper van. There are other pages dedicated to buying a VW camper van, and also buying a panel van for a camper van conversion. Buying a camper van should be the start of a wonderful exploring experience with your new vehicle. I’ve compiled this guide to help you get the most for your money and to avoid the pitfalls that can arise when buying a used vehicle. Disclaimer: This guide is designed to help you, but whatever you do is ultimately your choice and decision. I will not take any responsibility for any purchase you may make. I also cannot offer individual advice on vehicles. Take your time, and have fun! Here are the absolute essentials on buying any used vehicle. Set your budget – Set a total budget for your purchase. When you look at a potential purchase you need to factor in any repairs or alterations. Also include prices for tax and insurance. Only buy if you are absolutely sure. Don’t buy a vehicle unless you are absolutely sure it is right for you, and the vehicle is sound. If you have any doubts don’t buy the vehicle. You can always get someone else’s advice before making a purchase, including a professional mechanic. If you know what you are doing you can find bargains by buying privately. Check the sellers credentials. Always view the vehicle at the sellers house. Check the address on the log book is where the vehicle is. Keep the original advert. The vehicle must be as legally described. If you later find that it isn’t, approach the seller, or the police. Take a witness to oversee the purchase in case the van later proves faulty. Check the vehicles history. There any many services that check the police and insurance database to check for outstanding HP payments, crashes and thefts. Inspect the vehicle well. If you are not mechanically minded then consider getting the van inspected buy a professional. In the UK, the AA offer a 1 hour inspection and road test, and a full inspection with history check. The cost depends on the size of the vehicle, but expect to pay between £145 and £249. At most camper van and motorhome dealers you’ll be able to find a selection of used and new vehicles in one place. They are a great place to take a look around at the types of models available and the typical prices. Buying from a dealer is always more expensive than buying privately, but, you’ll get peace of mind as the dealer has a duty to tell you of any problems and the cost of rectifying them. Typically dealers will fix and problems with the vehicles, and often they’ll include an up-to-date MOT or roadworthy certificate. Most dealers offer at least a few months of warranty, typically 3 months. So if anything major, such as the engine blowing up, happens within this period, the dealer will fix this for you. If you are going to buy from a dealer visit as many as you can to determine which seems to offer the best value for money, and which have the best selection for your price range. As strange as it may sound, eBay (eBay.co.uk and eBay.com) is a great place to find camper vans for sale. You can easily find vehicles in your area (be specifying a search area from your home, e.g. 50 miles) and a price. Most listed vehicles have lots of photos and information, way more than you’ll find in a newspaper or vehicle publication. You can also ask the seller any questions you may have about the vehicle. You are bidding to buy – not to test drive. Once you make a bid you might win the vehicle and you cannot back out (within the last 24 hours of the auction anyway). ALWAYS test drive the vehicle before you bid. Contact the seller and arrange a meeting. Check everything about the vehicle and test drive it. Bid wisely – Once you have driven the vehicle, set a price that you think it is worth. Go to eBay, make your bid and wait. Do not get caught up in a bidding war with other people and pay too much for the vehicle. Paying with PayPal can offer you some protection. Traditional motor auctions offer a chance to get a vehicle at a bargain, the lowest price in fact. But it also carries the greatest risk. Remember most vehicles being sold at a motor auction are there because there are in an unsellable/unusable state (which should be avoided) or because the owner wants to get rid of it quickly (which can be a bargain). Stick to these rules and you might find yourself a bargain. Find and decide on the vehicle you want – walk around the holding area and find the vehicles that suit what you want. Stick to these only. Check the details, which will be posted on the windscreen carefully. Look around the vehicle, including the underside, and inside if possible. This is your only chance to take a good look around whilst the vehicle is stationary. Wait by the vehicle until it is started to be driven into the auction. This will be your only chance to hear it running. Check for smoke and steam from the exhaust. Check for any unhealthy noises. Does it drive striaght? Decide on a price for the vehicle, and do not bid over. You could find yourself in a bidding war and pay too much for it. Remember that most auctions required extra fees to be paid on top of the end auction price. Always keep these in mind. No matter where you buy your camper van from, you need to inspect and check the same things before making a purchase. Not doing so, and later finding problems can lead to expensive repair bills, and might even mean your vehicle is not usable. If you are not mechanically minded find a friend who is, or us a service such as the AA that will inspect the vehicle for you. Check for unhealthy noises when the engine is running. Oil leaks are generally a bad sign. See where the vehicle has been parked and check the ground under the engine. Look underneath and around the engine for signs of leaks, A dusty engine bay, free of any oil slicks is a very good sign. Check the radiator (in front of the engine). It should be intact and looking healthy. Old radiators start to fall apart at the bottom. Check for steam and smoke coming out of the exhaust. Both are a bad sign. Keep in mind though that diesel engines produce some smoke by design. Check the oil level on the dipstick. If it is low it shows the owner has not cared for the engine, and it’s probably a bad buy. Check for a blow head gasket – A blown head gasket is expensive to fix. There are ways of checking it. Take the oil filler cap off and look inside the engine head. Signs of white residue suggest a blown head gasket. Take the oil dipstick out. Signs of white residue suggest a blown head gasket. If when test driving the engine the water level in the radiator expansion tank has gone down a lot, there is a chance this water has gone into the engine, hence a blown head gasket. If lots of steam (rather than smoke) comes out of the exhaust when the engine is running, and warmed up, there is a chance the head gasket is blown. Check all of the hoses and pipes are clean. Rubber hoses should not be cracked, and metal pipes should not be rusty. Underneath the edges of the floor. All around each door, especially the hinges on panel vans. 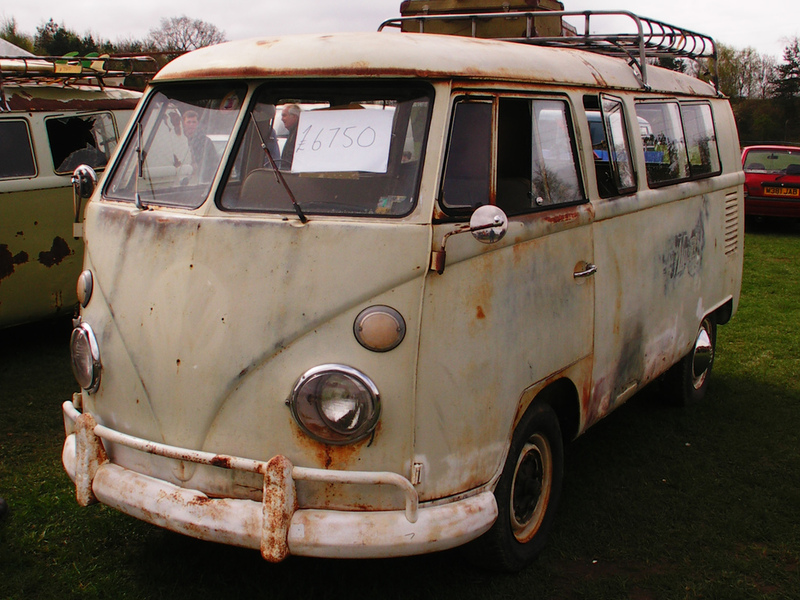 Rush is expensive to fix, especially in older vehicles such as VW camper vans. Get underneath the vehicle and prob the chassis and underside with a strong stick. If it crumbles or pits then there is some bad rust going on. Check all around the wheel arches, which is a hot spot for moisture retention and rust. Check the front and rear box sections of the vehicle for signs of an accident. On a front-wheel vehicle (most modern vans) there is not much you can check, but.. Check there are no oil leeks from the gearbox. All gearboxes will seep a little oil over the years. A light brown path covered in years of dust and dirt is ok. A dark black patch dripping with oil is bad. When driving the vehicle go to a car park and turn the vehicle on full lock. If there is a knocking sound the steering knuckle probably needs replacing. Check for leaks at the gearbox and the rear differential. Listen for the rear differential when driving, they are often neglected. If noisy it needs oil. Get under and grab the prop-shaft. If it is loose it needs new bearings, but this normally means a whole new drive shaft as it’s a complete unit. Hopefully this information will help you choose a great camper van. Please leave your tips and buying experiences in the comments below. Hoping to buy my 1st small camper van and considering importing from UK or Northern Irl. Transporter Traffic Vivavo that sort. Can someone recommend reliable dealers. I really like the check list. Good to know about AA inspection. I’m not 100% clear on registration abd buying a van. Do you need to be an EU resident to register a van? I’m traveling from Australia with my partner and we want to buy a van to trip around Europe but it seems to be more complicated with the paper work. In the UK anyone can register a vehicle. It’s very easy. You simply provide an address on the new keeper document, and then send you a new keepers document (V5 form). You can use a friends address. Insurance will be more complicated but still doable. Informative post ! I was fascinated by the analysis . Does anyone know where my business could access a fillable NC DMV LT-262 example to fill out ? There are some very useful tips here, my favourite one being a thorough check before making a decision. This way you can budget any work into your final price… It’s far easier to to make an informed decision if you have a rough idea of what may need doing to it to get into a condition you will be happy with! Another easy to make mistake is not checking parts you intent to use immediately. If you plan on using the water system straight away, test to see if it works. Simple but easy to forget about! If it is well maintained and in good mechanical shape it should be fine. It is has some service history then it should be reliable to take to Europe. All vehicles need maintenance, and whilst older vehicles require more, then can be fine for long trips. I am looking to purchase a campervan in Amsterdam preferably through a private sale, as they are cheaper than dealers. Anyone know where to look????? I have decided i would like to get an auto sleeper and there seems to be VW Topaz,Peugot symbol, Ford Duetto,swift Mondial high, the price range seems to be for a second had van £12,000-£16,000,for a van with approx 60,000 miles on the clock. Do you know which type is the most reliable as they all pretty much have the same spec. What parts are the cheapest to replace and what is the better van. I`m thinking of buying a second hand camper (Fiat Ducato 1987) that has 272,000 km on the clock and being absolutely useless with anything mechanical need a little help. I know its a lot of kms but will it still have some life left in it? How long can they usually run for? That’s quite a lot of KMs, and considering it’s getting quite old I would expect to have to pay a reasonable amount in maintenance each year. Things will need replacing on the vehicle each year most likely. If the vehicle is in good condition and is a good price then certainly consider it. If you are not very mechanically minded I would be tempted to get something newer to ensure your maintenance bills are not so high. Vehicles can last forever if treated properly, but the costs tend to get higher each year. In the US and looking at purchasing a VW campervan for long term traveling, probably around mountain areas. I’d be very gracious for any advice in the matter. VW campervans are quite small vehicles and offer little space. For long term traveling I would recommend something bigger. I’m not too aware of the different models on offer in the US. Does anyone know how to avoid buying a camper van in Europe and avoid the ones that have been treated with formaldehyde? Who are they? What are they like? We have been trawling the Camper Van internet sites for a few months. We have also tried to ‘check out’ individual operations with limited sucess. We have been most confident when real people have given us real accounts of their experiences. Thats where internet forums should come into their own . . .or at least they should? Are people reluctant to give bad reviews? or Are they afraid to name names because of possible subsequent legal action from the subject of their negative comments? Lets cut to the chase! Who knows anything about Iconic Kampers? Their website seems to give two locations for their operation, North Linc’s and Hull? One phone number. Viewing by appointment! There may well be logical explanations for this but we want to be reassured before traveling 50 miles to visit them. Can anyone help? I,m a bit suspicious of ikonic kampers. Are they selling LHD HYMERS that have failed the German TUV,because of hard to detect WATER ingress, mechanicaly the vans are sound. Please feel free to call us for any information on our stock and company.